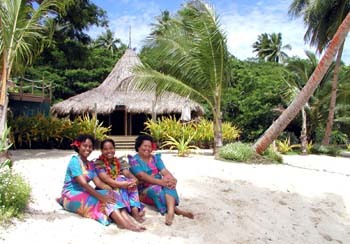 The Rainbow Reef Resort is situated on the southeastern side of Vanua Levu, a short boat ride from Taveuni. Several of Taveuni's dive operators are available to pickup and deliver you right to the Rainbow Reef in the world-famous Somosomo Straits. 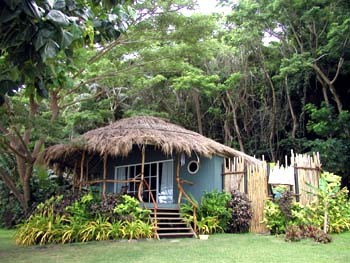 The resort is located on a 30-acre peninsula and faces due east towards Taveuni. It extends out into the Somosomo Straits and is the closest point across the straits. Hiking trails lead to surrounding beaches past panoramic lookouts. Isolated on a secluded fine white sand beach inaccessible from Savusavu except by boat is one of Fiji's most romantic resorts. The reason for this remoteness: close proximity to some of the best diving Fiji has to offer. Richard and Kari Stiers have achieved what Harrison Ford's character in the 1986 movie Mosquito Coast only dreamed of...a tropical paradise within a remote jungle. What impressed us first was the beautifully landscaped grounds. Originally from Seatle, Richard, an artist and Kari have built this tropical paradise using their artistic expertise. Using naturally available materials, he crafted their visions of paradise into the resort's lands and buildings. The first thing we saw as we approached the beach was the smiling, singing faces of the staff. We were immediately offered a tropical drink served in coconut shell with flowers to welcome us to the island. 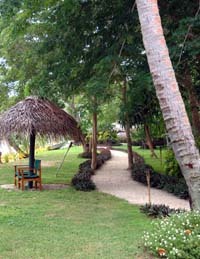 Built on a former coconut plantation, the grounds that separate the white sand beach from the hills behind have been carefully landscaped with local tropical plants. 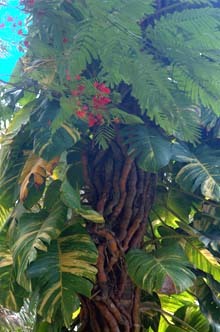 The gardeners selected plants that do well near the beach but also add to color and a sense of paradise to the surroundings. Each of the three bures have also been artfully designed. We especially loved the outdoor shower, private but with a feeling of a tropical waterfall. Next to the bathroom, tall walls of bamboo, flowering bushes and flat stones fill the atrium making showering outdoors a wonderful experience. 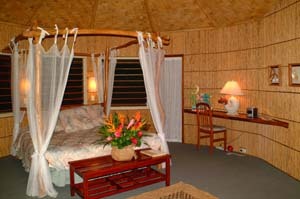 Our bure had a curved ocean-front verandah with a sunken hot tub. With only three bures along a half-mile beach, privacy and isolation adds to the romantic feeling. 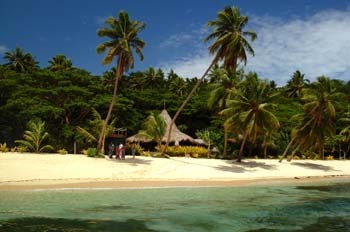 Now add some of the most delightful gourmet cooking anywhere in Fiji and you have paradise. The seaside pavilion allows you to choose between a somewhat more formal indoor dining or eating under the stars with the warm evening breezes and the sounds of the waves. The fragrant surroundings are replaced with the aroma of fresh-baked breads. The professionally-trained chef tempted us each meal with tropical and Pacific Rim cuisine. European, Indian, Caribbean, Asian and local specialties included freshly-caught seafood and gourmet wood-fired pizzas. This is not a place to be on a weight-loss diet, especially with the deserts that never failed to amaze. 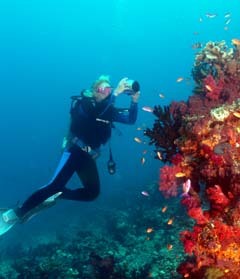 But it is the proximity to the world famous Rainbow Reef diving that sets this resort apart from those on Taveuni. Dive operators will pick you up right on the beach in front of the resort and drop you in the water within 5-8 minutes of the shore. 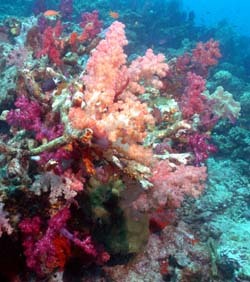 Each day we explored two of the best dive sites in search of the finest of the Fijian soft corals. By now, Lynn was tuned to the pallete of colors that awaited her. Her favorite dive site was Yellow Tunnel. 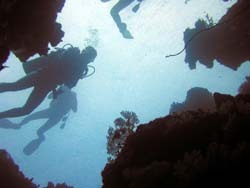 We went down and swam to an area which was full of yellow corals. One by one we ascended a vertical tunnel covered with these spectacular soft coral growths. She was the last person to enter the tunnel and wanted to stay there and photograph forever. Gently drifting through the tunnel, carefully not touching or disturbing the soft corals, we selected sections to photograph. Overhead, the rest of our group waited. We exited only to swim around to do the tunnel again. Another special treat is to return to the Rainbow Reef resort for the surface stop. While the dive boat waited, we strolled up the beach to the pavilion for a cold drink and to wash our cameras. Boy, were we spoiled! With the Great White Wall, Fish Factory, Rainbow's End and other great dive sites within minutes of the resort, diving the fabulous Somosomo Straits could not be easier. Birds, peacocks, butterflies and floral tropics. The area is home for some very rare and exotic birds including the Taveuni parot. Our short stay did not leave any time to even start to get bored. When we were not beachcombing, we wandered the trails accessible from the resort. Manicured paths (sometimes with welcomed handrails) brought us to a cliff overlooking the magnificent Somosomo Straits with the garden island of Taveuni beyond. A short walk brought us to another secluded beach to snorkel in the calm warm waters. 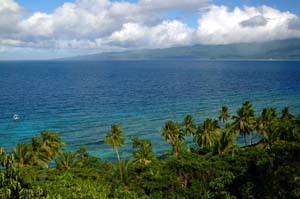 If we had more time, we could have taken a boat to Korolevu Island off Taveuni for picnicking and more snorkeling. As Taveuni is so close, hiking, village tours and waterfalls are all easily accessible. Not to be missed is the Bouma Falls hike and swim. The very friendly Fijians that work at the resort made the time spent at Rainbow Reef even more pleasurable. Their special attentiveness and geniality was always appreciated. The resort supports 15 local families and the staff is very grateful for the opportunity to work at such a wonderful resort. This secluded setting on a fine sand beach, facing one of the most picturesque straits, makes the Rainbow Reef Resort a place for lovers. Whether walking on the beach hand in hand, honeymooning or getting married with a Fijian ceremony, this resort is the place to be. With only three bures, it is a quiet and private retreat. A special battery-driven electrical system operates all night to guard against unnatural noises. At night, one hears only the sounds of the wind, the gentle waves upon the beach and a melodic wind chime. The bures offer a romantic retreat and are adorned with lovely artwork and shells on the walls. A king-size four-poster bed, chaise lounge and very luxurious rattan chains make for cozy evening relaxation. One could not ask for more romantic surroundings. Our Orchid Cottage was situated at the end of the beach and had a hot tub in the front verandah that looked out to the ocean. 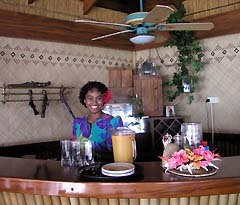 Each morning our breakfast was brought to the door by our smiling Fijian hostess. For the ultimate in romantic dining, a candlelit gourmet dinner can be hand-carried down the beach to your bure. If you are looking for a five-star romantic destination and want to dive the best Fijian reefs with ease, the Rainbow Reef Resort promises to fulfill your dreams.